Submitted by Michael on Wed, 05/10/2006 - 00:40. 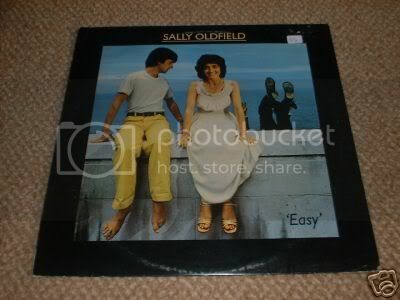 In my search of other Oldfield items on the bay (to tighten my guestimate on his guitar), this Sally Oldfield cover gave me a laugh. Posted by 1bassleft on Wed, 05/10/2006 - 02:46. My older brother had that album. It was extremely dreary. In those days, any old warbler could get a deal just because their more famous brother wangled it for them. Wouldn't happen today, would it, Miss Natasha Bedingfield? Posted by Michael on Wed, 05/10/2006 - 02:52. Looks were less important too as that album proves. Posted by USGold on Wed, 05/10/2006 - 13:32. Posted by USGold on Thu, 05/11/2006 - 16:32. Posted by Michael on Thu, 05/11/2006 - 23:08. Not only does he know all the chords, but he also has an impeccable dress sense. Posted by lee_UK on Fri, 05/12/2006 - 00:15.
why is he wearing eye shadow? surely he's too young and innocent? Posted by Michael on Fri, 05/12/2006 - 00:22. The shirt through me off, I didn't even notice the eye shadow. The leopard strap is just wrong. Is that shirt PVC? Posted by 1bassleft on Fri, 05/12/2006 - 03:07. You may think that; I couldn't possibly comment. Looks like her bro has a nasty habit of pushing potentials off bridges, though. Posted by 1bassleft on Fri, 05/12/2006 - 03:10. Is it just me, or does "Guitar George" look like a broom-cupboard liaison result of Alan Partridge? Posted by Michael on Fri, 05/12/2006 - 03:13. I didn't realize it was legs on the Oldfield cover. Heck now it all makes sense. I thought it was some abstract art in the background walking along the waterfront.